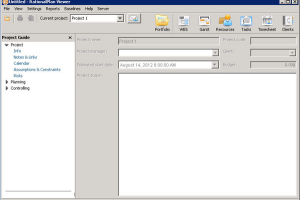 "Project viewer for project managers and stakeholders"
Project management is rising in the corporate world. As such, interesting and related software gets developed and here we present you the RationalPlan Project Viewer. For those not active in the project management field or learning about it, it's not all about the project manager. Yes, this person needs to take care of the process groups to initiate, plan, execute, monitor and control, and close the projects, but stakeholders also play an important role. These stakeholders, as well as other people involved, might have to check and overview the evolution of the project into the tiniest details. For this reason RationalPlan Project Viewer has been developed and can be freely distributed. Without entering further into specific project management details, this program contains all the basic tools for project management. The next step is portfolio management, and this software even includes a feature for reviewing all projects, as such, staff managing multiple projects might also benefit this program.